C-DAC Common Admission Test (C-CAT) is conducted for admissions to all PG Diploma Courses of C-DAC. Every year, C-CAT is usually conducted in June (for August admissions) and December (for February admissions). Admission for February batch has been over. Now, the admission for August batch is going to start in the month of June 2019. CDAC C-CAT 2019 exam will be held in the first week of July 2019. Candidates who will clear the June 2019 C-CAT will only be considered for admission to C-DAC’s PG Diploma courses of August 2019 batch on the basis of their performance in the entrance examination and center/course preferences. 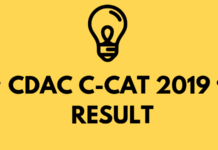 Check complete details on CDAC C-CAT 2019 from this page. Latest: C-DAC admission process for February session is over now. Interested candidates will be able to register and apply for C-CAT 2019 when released. Only registered candidates will be able to download admit card of C-CAT. After an exam, they can check the result and download the rank card. All those who will appear in the exam can check result/rank in online mode. Know all important dates for C-DAC Common Admission Test (C-CAT) 2019 here. Candidates must appear in an exam in order to get admission in PG Diploma courses at Centre for Development of Advanced Computing. C-CAT has three sections (Section A, Section B, Section C) of one-hour duration each. Depending on the category of courses selected by the candidate, he/she will have to either appear for just one test paper (Section A) or two test papers (Section A and Section B) or all the three test papers (Section A, Section B and Section C). The medium of C-CAT is English. CDAC C-CAT Syllabus is provided below for the exam preparation. Candidates who are going to appear for the CDAC C-CAT 2019 can refer to this syllabus for preparation. Syllabus of the different sections of test papers in C-CAT. The list of reference books for the various topics of C-CAT is given in Table. Candidates are, however, advised to read more books than the ones specified in this table. Reference books for the various topics in C-CAT. C-CAT for admission to the Aug 2019 batch of PG Diploma courses will be held on the month of June. Candidates may choose one of these dates as per their convenience/availability while filling the online application. The tentative schedule for different test papers of C-CAT is given below. 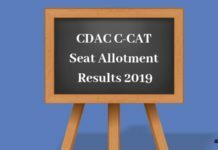 The admit card for CDAC C-CAT 2019 will be issued in online mode only. The exam conducting body does not send any printed admit card to the candidates individually by post. The candidates can download it from the Student Login by entering details such as Form Number and Password. It is mandatory for the candidates to carry the print out of the CDAC CAT Admit Card on the day of the examination. Along with it, you also need to carry a valid id proof as well. It is advised to the candidates to read the important instructions given on the CDAC C-CAT Admit Card 2019. C-CAT will be conducted in the computerized mode in various cities across India. The list of cities where C-CAT will be conducted in Dec 2018 is given below. C-CAT centres will be allocated to candidates on a first-come, first-served basis of application, depending on the centres’ seating capacity and availability. The C-CAT date and city once selected in the online application form cannot be changed unless approved in writing by C-DAC, subject to availability of seats requested. All such signed letters of requests with proof of valid reasons should be received at C-DAC ACTS, 5th Floor, Innovation Park, Sr. No. 34/B/1, Panchvati, Pashan, Pune 411008, before the last date of C-CAT application. Candidates will have the option to use their own laptops for C-CAT. Such candidates have to choose the ‘Own Laptop’ option in the online application form. The laptop should be LAN and WiFi enabled and these ports should be working. The laptop should have antivirus running on it and should be free from any virus, malware, and spyware. The laptop should have proper power backup for the entire duration of the exam. Important Note: Candidates would be entirely responsible for the functioning of their laptops during C-CAT. C-DAC reserves the right to deny a candidate in appearing for C-CAT in case of non-functioning or malfunctioning of his/her laptop. No examination fee will be refunded to such a candidate. sir my cdac rank is 5600 so can you plzzz let me know that what collage is i am elligible for.. In the address bar enable popup option then you can able to take…. As I was delayed aware of CDAC application and by the time deadline was over, i could not apply for the same, but i am trying hard to get in trough CDAC. I would be privileged to join CDAC institution for my career growth. Please help me with possibilities of offline/online registration after deadline so that I can attend the exam held and join the institute. I am not able to know my C-CAT july 2018 result, please help me. Please share me the next schedule examination. Hi I do not have admit card print options, and my exam schedule is 16 Dec, plz help me out what to do???? I have done all the procedure which is successfully completed. hey there kindly provide me the credentials so I could help you better. Hi my name is Rani Shende, n I did my engineering 2017 bathch, can you plz contact me on my mail, [email protected]. Do they release answer keys? And if yes, after how many days approx? The schedule is not out yet.